I am sure that some of you may know if you have read my blog posts before, but Illamasqua is a brand that I am just not very sure about. I have tried pretty much everything from their current line of products, and I have to say that I am yet to find something that I really love. The foundation breaks me out, the eyeshadows are ok, and the lipsticks are as dry as the Sahara Desert. But, I have some of their blushes in my collection and I thought that it was about time that I try them out for myself and let you guys my thoughts on them. I wanted to really take my time on writing this review, because I didn’t want my opinion of the foundations and other products to hinder this product. You may already know, that when I was starting out in makeup after I had finished my degree, I did a course at my local college and everybody has to purchase an Illamasqua makeup kit. It set me back nearly £1000 and what we got in the kit was poor and it lacked in essential items like a concealer and even a mascara. From there, my opinion on the brand, through no fault of their own was through the floor. Once I started to try the products, there just seemed to be red flags propping up all over the place in my opinion and it really turned me off from the brand. But, like I said, I am going into this review with an open mind and I have used these quite a bit in order to get my full opinion on them. This review is going to be centred around the shade ‘Beg’. This is a peachy colour and it is the shade that seems to work the best with my skin tone and my natural colouring. I have pretty much every single shade from their line of blushers, but most of them didn’t quite sit right with my skin, but I have to admit that I very much like the shade of this Beg blush and it always seems to compliment my tanned/olive complexion very well. While trying out these blushes, this is the product that I continue to reach for because I feel like it suits me quite nicely. The first thing that I want to mention is something that I actually really like and that is the packaging. 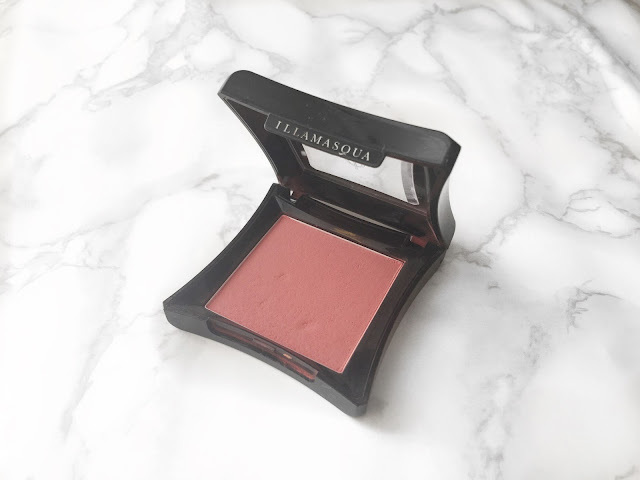 I think that these Illamasqua Blush compacts are so stunning, and I think that they suit the brand down to a tee. If you compare these to the likes of a MAC Blush compact, I would say that the Illamasqua one looks much better in appearance and seems to be made to a higher quality. I will say that it is a touch bulky, so it isn’t great for travelling with because it does take up quite a bit of room in my luggage, but that isn’t really a concern for using it on an everyday basis. One thing that I do have to say about this blusher is that it is incredibly pigmented. When I first started to try this out, I used my finger to swatch some onto the back of my hand and I couldn’t quite believe the amount of colour pay off from this little blusher. Plus, with this being such a huge pan and with the high level of pigmentation, I can see this single blusher lasting for an incredibly long time, depending on how you use it. I have tried so many different blushers over the years with different finishes and from different brands and the pigmentation of this is unlike anything that I have tried before. One thing that I will say about this Illamasqua Blusher is that it seems to be very softly pressed into the pan, which means that there is an incredible amount of fall out. When I tap my brush into this lightly, there appears to be more loose powder in the compact than what is actually on the brush. Brands sometimes to this because it allows the person using the product to get the best amount of colour pay off, but it can get bloody messy, especially if you have light coloured carpets like I do, because all of that loose powder ends up somewhere! Because of this being a soft pressed powder, I find that it has quite a chalky texture, which Ifind quite difficult to blend onto the skin. I have tried a whole array of brushes with this from cheap ones from Morphe to ones at the other end of the spectrum like Tom Ford and to me, nothing seems to get this product looking flawless into my skin with the rest of my makeup. I have even tried to go in with very minimal product and building it up very slowly and gradually, but somehow, I never get a natural and airbrushed kind of look, like I can get with other blushes from my collection. I really do feel awful writing this post, because for me, this product just didn’t work. There is no denying that the shade of this ‘Beg’ shade is just stunning and perfect for somebody with olive undertones like me and the pigmentation is second to none. My issue is just how messy this product can be and the chalky texture. I am sure that some people will adore this blusher, because there really is a lot to love about them, but they just aren’t for me. If I was on the hunt for a new blusher I would be more tempted to trying out brands like Nars and Charlotte Tilbury, which are in a similar kind of price range. I will leave a link to this product down below in case you want to check it out. Make sure to leave a me a comment down below and let me know if you have tried this out and tell me what you thought about it. I think I'm going to give a couple more shades a go, I have recently been trying their cream blushes and they have been working really nice on my skin! The shade looks beautiful, too bad it does not stick to the brush and it is difficult to blend. I know it is so disappointing because I really love the shade! I know I was so disappointed because it is such a stunning shade! I just felt like because of how powdery it was I didn't have control of it very well! I have been trying Illamsaqua cream blushes and they have been really nice! This looks so good on you! I'll have to check out a blush from Illamasque to match my skin!